During Wearable World Congress 2015, formerly known as GlazedCon, Pebble CEO Eric Migicovsky spoke a bit about how creating the first Pebble was like a "horse race." Migicovsky knew it was a race to make it to market first, and needed to make a working product before larger companies had a chance to fully mobilize production. Larger companies, which are now Pebble's primary competition, became a major discussion point during this morning's keynote. According to Migicovsky, one of the first questions the young company received was, "What if Apple or Google make one?" "Apple did come through and it's spectacular. ... [People say there's] a lot to learn from them because it took them seven years, but we don't worry about that. We're focused on keeping is simple, affordable and useful. Google has put forth a dozen different watches. Apple has put forth a high fashion watch ... and this is great," Migicovsky said. Speaking to smartwatches in general, Migicovsky notes that it's significant Apple chose the route it did in producing more expensive wearables though he was quick to add that Pebble's been at it for seven years learning and evolving the Pebble: "It's a platform visibly on you, a representation of who you are, a statement to the world. Pebble aligns with this very well." Wearable World Conference started on May 19 and will continue until May 20. Like the original Pebble smartwatch? 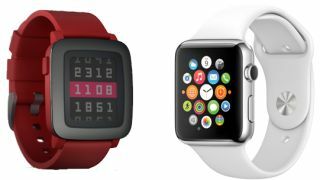 Its successor, the Pebble Time, is coming soon.